Ultra-thin floor warming systems conveniently install under tile and stone to add soothing warmth and comfort to your favorite rooms. There are several tools available for cutting tile. Most of these can be rented for a very reasonable price at most home centers and rental yards. A ceramic tile cutter is very similar to a glass cutter. It has a small tungsten wheel which scores a line along the tile. After the line is scored it is snapped clean. Most tile cutters have a guide which makes straight cuts easy. To use a tile cutter, mark the tile with a pencil. Place the tile in the cutter making sure to line it up evenly with the cutting wheel. Lightly run the wheel across the mark to make sure the wheel stays on the line throughout the entire cut. When you are sure it is lined-up, place firm pressure on the handle and move the wheel across the mark. Be sure the wheel has scored the tile. Once scored take the tile and place it on the edge of a flat even surface with the cut line hanging over the edge of the surface. 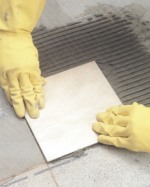 Place one hand on the surface of the tile to hold it in place. 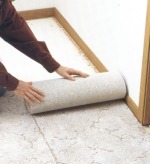 With the other hand, snap the tile by placing firm pressure on the hanging end of the tile. The tile should snap clean. If you have a lot of cutting to perform it is advisable that you rent a wet saw. A wet saw is easy to use, but I would ask for directions from the rental yard. The extra expense for a wet saw rental is worth every penny. Tile nippers are used to cut small curves and unusual shapes to fit tile into tight areas. Nippers work by biting off small bits of tile at a time. 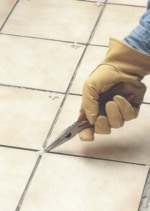 To use a tile nipper, mark the area on the tile you wish to remove. Next take the tile nippers and remove small bits from the tile until you reach the line and have completely removed the area. A coping saw is a fine wire time saw that can be used for cutting very delicate cuts. For example if you need to make a ninety degree angle on a tile near a corner, a coping saw would be the tool of choice. The use of a coping saw is very similar to using any other hand held saw. Make sure you hold the saw steady and do not force the blade on to the tile. Let the blade do the cutting.